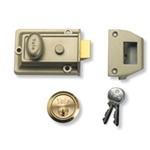 NB: Rim locks and nightlatches are fitted at slightly different heights on individual doors. When fitting the 72" and 78" length London Bars, a little of the top or the bottom of the London Bar will probably need to be removed when fitting - by cutting with a hacksaw. The 72" London Bar is approximately 6" shorter than the height of a door frame - to help avoid the need to hacksaw off a piece of the bar. 9612 & 9613 Ingersoll Staple - This is a left or right 'handed' 30mm x 70mm London Bar staple to fit over the the Ingersoll SC71 rim lock. 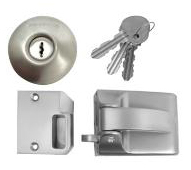 It has a small cut out section at the top of the staple - to allow the Springbolt of the lock to pass through.